How is a Temporary Crown Made? When a permanent crown is made, the dentist starts by altering the natural tooth so it can properly anchor the restoration. This is followed by using an impression material on the altered tooth so the dental lab has a mold to create the permanent version. However, prior to any alterations, an impression is taken so the temporary crown can be made. 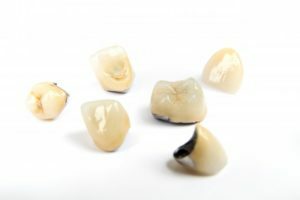 This temporary crown uses acrylic resin, which is easily accessible in the dental office and can be made and placed the same day as your appointment. It can also be shaded to blend in more effectively with your smile as the permanent crown is being made. If you spend a lot of time in the public eye or simply care about your appearance in general, you probably don’t want your smile to look poor over the next two weeks. Temporary crowns help you maintain your appearance as the permanent crown is being made, rather than worry about photos or looking odd to those around you. Buffed down teeth are not exactly pleasing to look at. While aesthetics are important, it’s far from the most important reason why dentists utilize temporary crowns. When a tooth is prepared, a good amount of enamel is removed. In some cases, most of the tooth is removed, leaving behind mostly dentin. Dentin contains many tubules that contribute to tooth sensitivity. Without proper protection, this will cause many patients to experience discomfort. In this case, temporary crowns act as a shield to hot and cold stimuli, such as food and beverages. Temporary crowns help you maintain your appearance and comfort, but they also prevent future medical consequences. For example, they prevent neighboring teeth from shifting before the permanent crown is placed, even though the natural tooth is still inside the root. Furthermore, temporary crowns prevent gum tissue from growing over the prepared tooth, only making the fitting of a permanent crown more difficult. Just because a crown is temporary doesn’t mean that it shouldn’t be properly fitted and shaped to align with your bite. If the crown doesn’t fit right, it could put undue stress on your neighboring teeth and temporomandibular joint, so dentists always take this into consideration for your treatment plan. Need dental crowns in Alamo Ranch placed? Don’t hesitate to schedule an appointment with a dentist today! The dentists at Alamo Springs Dental always make sure that the crowns you receive are durable, reliable and meet your aesthetic standards. To learn if a dental crown can save your tooth or ask any questions you may have, you can contact the office through our website.